Vincent Van Gogh was a Dutch-born artist who eventually moved to France. Although to this day, he has a reputation of being insane, approaching art as therapy and being a hermit, none of these are true. Van Gogh had some kind of a medical condition similar to epilepsy; he would have fits where he couldn't function at all. He would have to be calm and lucid in order to paint. He was a very well read, intellectual who had traveled a lot in his youth and approached painting as an intellectual theory. He was very communicative and was in constant contact with the world; he even wrote to his brother and friends when he was in the asylum. He tried out a couple of different professions before he decided to become an artist. He was obsessed with nocturnal scenes in the beginning of his career and his palette was very dark. 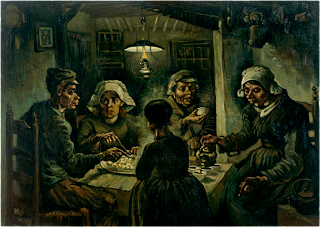 When he painted The Potato Eaters in 1885, he tried to create light effects in the dark by illuminating the peasants' faces with the light from the lamp. In his letters, he talked about the images being lit from the top with light eyes and dark lower faces. He might have read Charles Blank's book about the grammar of design and trying to read and understand art intellectually. 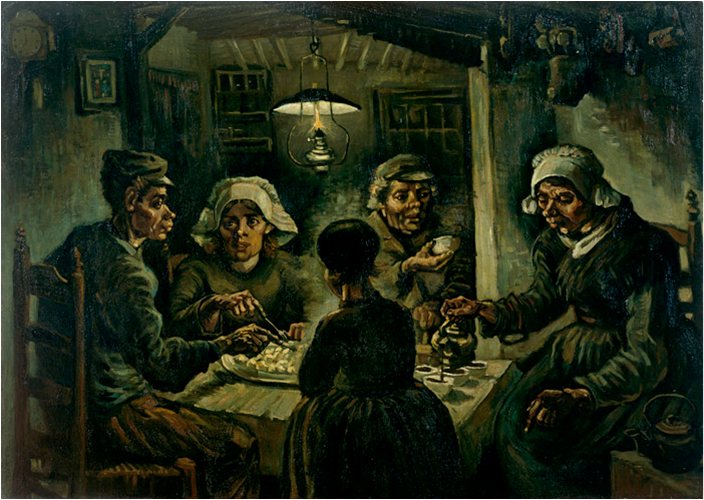 Van Gogh strove to be a true 'peasant painter' and asked these peasants to pose for him in the winter months when they didn't have to get up early to go to the fields in the morning. He spoke of them as having a certain honesty and being connected to the earth. They had used the same hands to dig the potatoes form the earth that they were using to take food from their plate - they deserved to take this time. But at the same time he emphasized that they were different from him and not civilized people. Van Gogh did attend art school in Antwerp and he also collected Japanese prints that he made copies with slight variations in color and patterns but still literal studies. He traveled to Paris 1886- 1888 where he further studied Japanese prints and learned about Impressionism; this caused a huge change in his palette as well as subject matter. Pere Tanguy was an art dealer and a socialist. This was about the time Van Gogh was coming up with his ideas of an artist's colony where they could live and work together. Around this time he had read about the Japanese Buddhist monks, Bonze, who lived together and he was hoping to model his Artist's Paradise after these Japanese Monks. 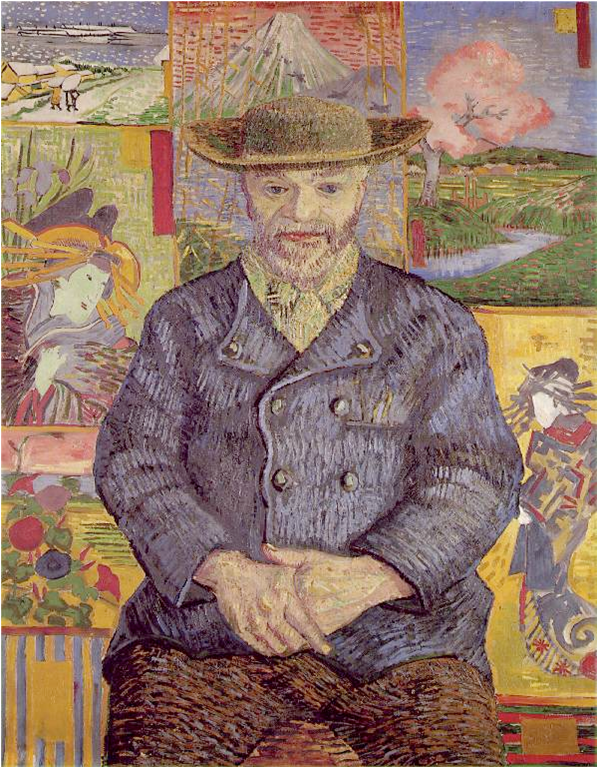 In the painting Portrait of Pere Tanguy, Van Gogh has him sitting in a Bonze pose. He also has the Japanese prints Pere Tanguy dealt in behind him with Mount Fuji at the top, coming out of his head and the female Japanese figures almost interacting with him. The beginnings of the development of his signature style of linear brush strokes can be seen here. Van Gogh, unfortunately had a reputation as being melancholic and having fits which wasn't conducive to seducing any artists to come and live with him. 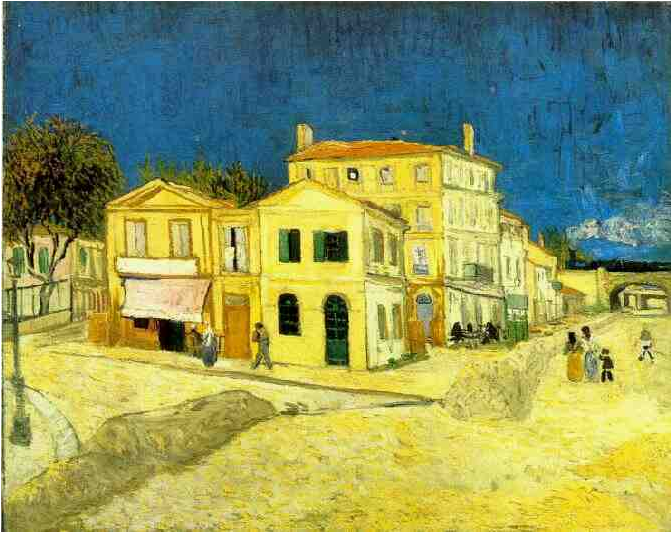 In February of 1888, Van Gogh, moved to an ancient town, Arles, in the South of France, to escape Paris and to establish an artist's commune called "the Studio of the South" which would be Van Gogh's "painter's paradise." He would try to get Gauguin to come and join him there who was living in an artist's colony up in the North of France in Normandy. Gauguin actually owned one of Van Gogh's Sunflower paintings. So when Van Gogh moved into the Yellow House before Gauguin came down to visit him, he started to paint a series of sunflowers to decorate his house. Van Gogh wanted to create a sense of harmony, and warmth so he started to use color as an expressive tool for these ends. 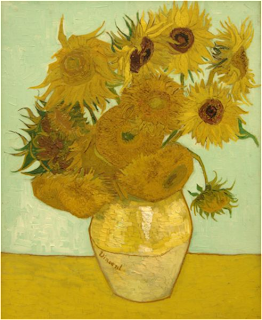 He painted the sunflowers as decoration for his home but even in these still-lives all the flowers were in action. All the flowers are animated with petals tipped up or leaning forward as if wanting to talk to the viewer. Through color, Van Gogh wanted to convey how he felt about a place. He believe complementary colors were harmonious and peaceful. 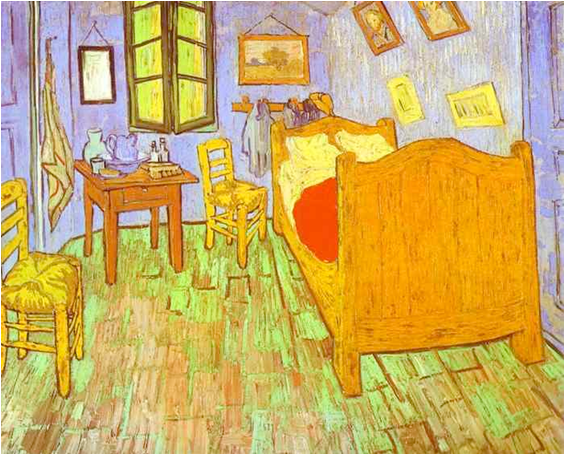 In his paintings of his bedroom, he wanted to represent a place where one could rest the brain and the imagination. He believed square pieces of furniture portrayed rest and serenity. In The Artist's Bedroom in Arles, there are no shadows and the paintings on the wall are of friends and family and a landscape - nothing to disturb your peace. 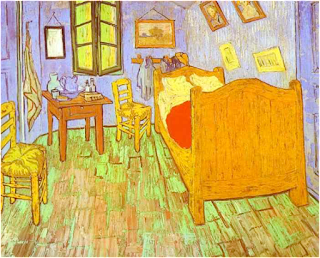 Van Gogh wanted to give the viewer his version of restfulness through his colors and furniture. He went back and revisited the same motif several times to improve upon it. He reworked this scene with slightly different colors made some other changes. He was always struggling to make it better. Perhaps the best way to try to understand Van Gogh, is to read the letters he wrote to his brother Theo, an art dealer in Paris. http://www.vangoghletters.org is a website that has the 902 letters that went back and forth between the brothers. It is truly a fascinating way to gain some inside knowledge into the mind of this complex man who has been surrounded with a lot of myths that has even colored the way we read his art. In all of Van Gogh's work color and light are the main figure. On thing that you don't see is shadows. Even though there were shadows in his life, they never made it to his paintings. I my mind that's what makes them so good.